Discover the benefits of adding Flexall® topical pain relieving gels to your clinical and training room settings. Flexall gels help increase patient compliance and enhance ultrasound, cryotherapy, T.E.N.S., and massage therapies. 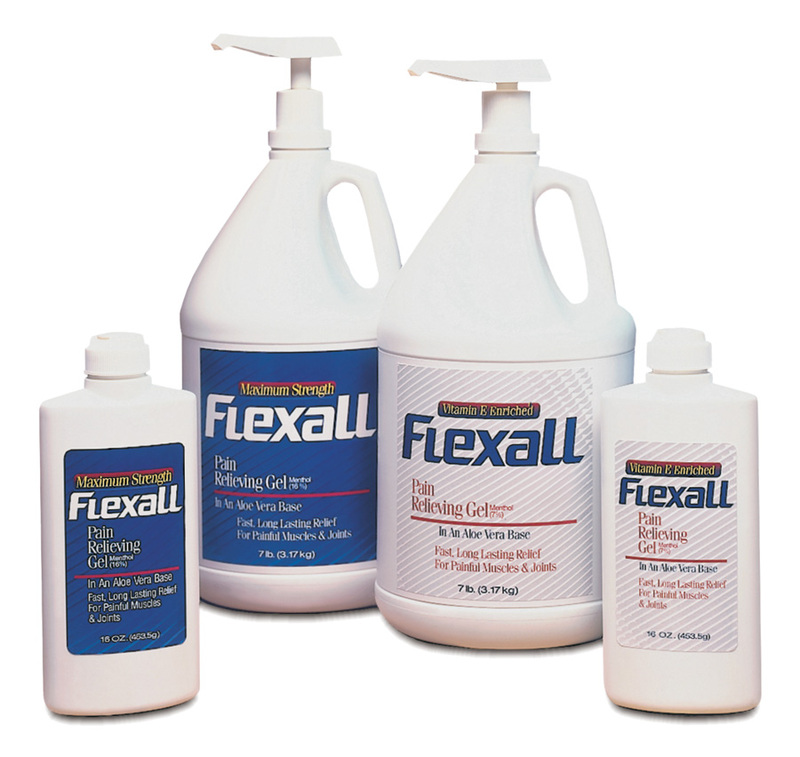 Flexall, Flexall Maximum Strength, and Flexall Ultra Plus. Trainer’s Choice® 5000 helps the equine athlete compete, perform and endure at the peak of its training and conditioning. Trainer’s Choice 5000 should be part of every training and conditioning regimen for performance horses. Ceres’ Secret® Aloe Vera Gel is a greaseless skin moisturizer made with 100% whole leaf aloe vera gel; cold processed to retain all the natural goodness of aloe vera. Discover why quality Flexall® topical pain relieving gels are invaluable in clinical and training room settings. Incorporating Flexall gels into your treatment regimen will help increase “at home” patient compliance, enhance ultrasound and cryotherapy, calm the pain between T.E.N.S., and intensify soft tissue massage. Since 1987, the Flexall brand family has proven beneficial in sports medicine, injury prevention, rehabilitation, work hardening, and pain management programs. Flexall gels are among the top-selling brands in the consumer market and are well-known and trusted by patients. Flexall gels also continue to be incorporated into the care of the world’s greatest athletes in sports programs around the world. Flexall is used by athletes in all levels of competition including major sporting events such as The Olympics, The Super Bowl, The NBA Finals, The World Series, The Stanley Cup, college basketball tournaments, and college football bowl games. Flexall (7% menthol) and Maximum Strength Flexall (16% menthol) are unique aloe vera gel formulas with natural oils (eucalyptus, peppermint, thyme) and vitamin E. Maximum Strength Flexall Plus contains three active ingredients (16% menthol, 10% methyl salicylate, 3.1% camphor) in the same vitamin E-enriched aloe vera base. Flexall gels provide fast, penetrating relief from painful muscles and joints due to minor arthritis pain, simple backache, muscle strains and sprains, bruises, and cramps. Flexall gels are versatile enough to aid in treating the acute, sub-acute, and chronic stages of injury. The demands placed upon the body of a performance horse often result in sore muscles and joints. Use Trainer’s Choice 5000® on the equine athlete and help it compete, perform and endure at the peak of its training and conditioning. Originally formulated for racehorses, Trainer’s Choice 5000® is a unique, veterinary liniment gel with menthol and aloe vera. Trainer’s Choice 5000 acts as an aid in the temporary relief of minor stiffness and soreness in the back, withers, shoulders, elbows, forearms, knees, cannons, buttocks, thigh/rear quarters, gaskins, stifles, hocks, tendons, suspensory ligaments, and fetlocks due to overexertion. 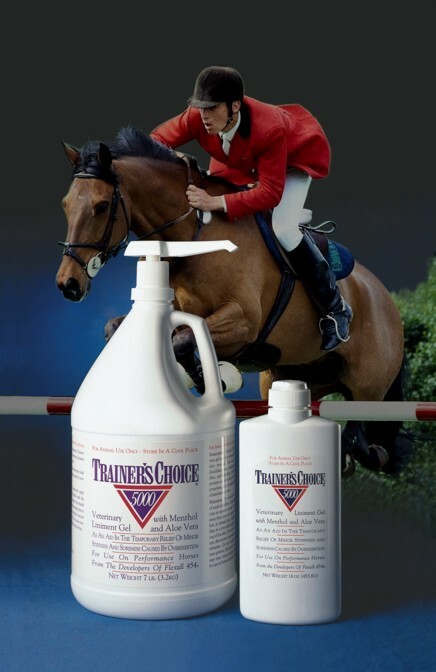 Trainer’s Choice 5000®benefits the performance horse before and after exercise as a liniment, brace, and body wash. Combine with ice or cold water. Use under breathable standing bandages and wraps. Trainer’s Choice 5000®absorbs quickly and completely, is greaseless, non-staining, and easy to apply. Trainer’s Choice 5000® is available in 16 oz., 7 lb. Ceres’ Secret Aloe Vera Gel absorbs quickly and is non-staining. It’s like having an aloe vera plant in a bottle. Here’s a fresh solution to skin care problems. Ceres’ Secret Aloe Vera Gel is a greaseless skin moisturizer made with 100% whole leaf aloe vera gel; cold processed to retain all the natural goodness of aloe vera. Use Ceres’ Secret Aloe Vera Gel topically to bring relief to dry or chafed skin, chapped lips, and minor burns including sunburns, abrasions, diaper rash and razor burns. Ceres’ Secret Aloe Vera Gel is available in 8 oz. and 0.14 oz. unit dose dispensers.